Rangers have made a formal complaint to the Scottish Football Association about referee Willie Collum, who sent off Daniel Candeias. The club's appeal against the second yellow card shown to Candeias in their 2-0 win over St Mirren on Saturday was dismissed by the SFA and they have responded by complaining about Collum. Candeias was dismissed by the 39-year-old referee in the aftermath of Rangers' second goal, which was scored in stoppage time. Rangers appealed on the latter, but the SFA dismissed the claim, meaning the Portuguese winger will miss Sunday's Premiership clash with Motherwell. 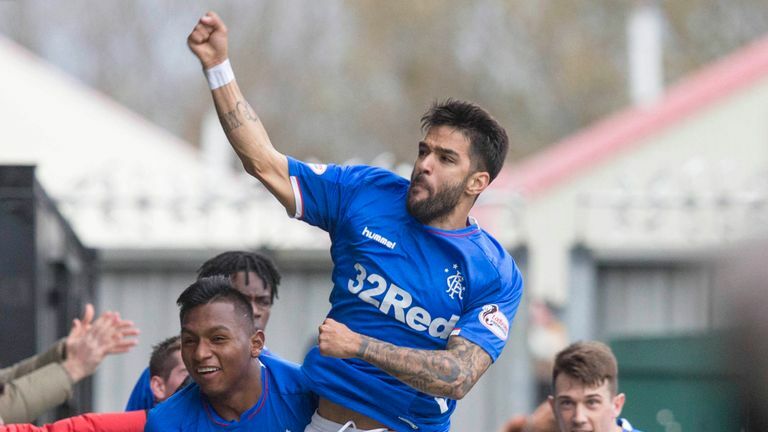 The club issued a statement, which read: "Rangers are extremely disappointed with the decision of the Scottish FA's Judicial Panel to dismiss our appeal against the second yellow card shown to Daniel Candeias in the closing seconds of last Saturday's match against St Mirren. "Rangers afforded the governing body the opportunity to let common sense prevail and we are surprised they have chosen not to do so by correcting what was, and what remains an inexplicable decision by the match referee, Willie Collum. "Rangers shall now seek a fundamental review of the rules relating to red cards which result from two bookings of a player in a game. "If one of these decisions is obviously wrong, it must be possible to correct that mistake. It is wrong that players' livelihoods and careers can be impacted without the opportunity of redress, especially when the official responsible for the miscarriage of justice is allowed to continue as though beyond question or reproach. "It defies belief that this same referee, who got it so blatantly wrong last Saturday, is awarded one of the biggest matches in Scottish football this weekend while Daniel Candeias is denied the right to go to his work. This, frankly, is unacceptable. "Furthermore, it is understood that a number of people within the Scottish FA are in no doubt Mr Collum's judgment was flawed and Rangers shall also now be submitting a formal complaint about the performance of this referee. "The manner in which he reacted to an incident involving our player made it obvious he did not give due consideration to his decision. "This is by no means the first time errors of judgment have been made in matches involving this official and clearly there is an underlying issue which requires to be addressed."